Most of our joints suffer wear and tear throughout life. Osteoarthritis, a common painful functional disorder of joints, is characterized by loss of articular cartilage. Loss of cartilage leads to gradual narrowing of joint spaces and thickening of bone ends.Cartigen has been designed for nutritional support of the joints. 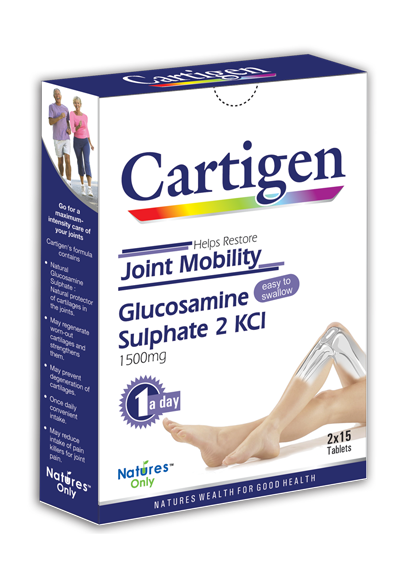 The active ingredient of Cartigen is glucosamine sulphate, which is utilized by the body to create glycosaminoglycans, an enzyme that is essential for cartilage repair. Natures Only Cartigen provides high-strength sodium-free crystalline glucosamine sulphate to compensate for the deficiency of glucosamine that occurs with aging.